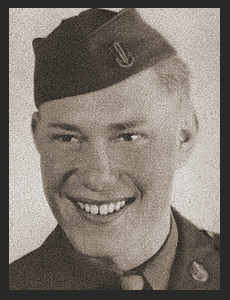 Cpl Glenn D. Givens, son of Mr. and Mrs. Clinton H. Givens, attended Manitou High School. Entered Air Corps in Oct. 1942, trained in Lubbock, Texas, Scott Field, Ill., Lincoln, Neb., and Panama City, Fla.; is now on duty in Scott Field, Ill. Awarded Good Conduct Medal.